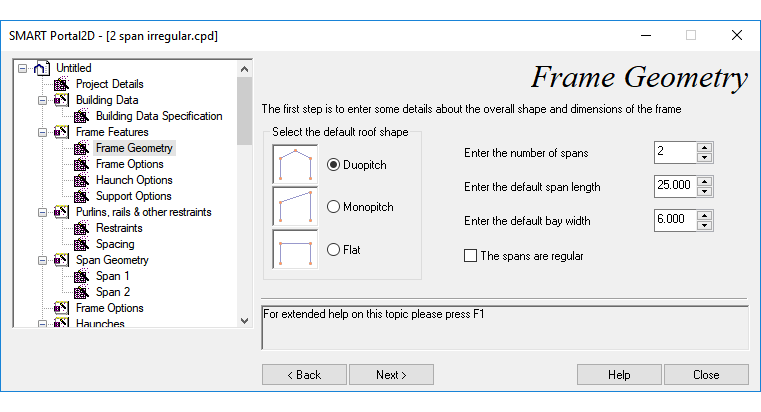 CADS SMART Portal 2D is a program for the structural design of main portal frames supporting a wide range of frame and roof configurations, including single and multi-span permutations of duopitch, monopitch and flat roofs including steps in the roof and changes in foundation level. A user-friendly wizard guides users through a logical process of data input, automatically generating the frame loads and lateral restraints. 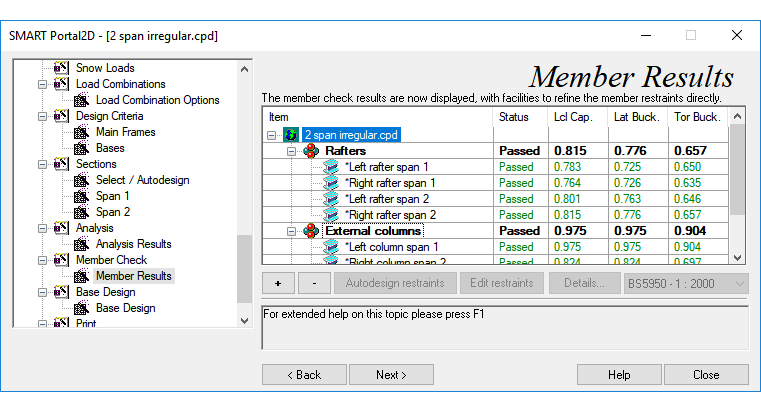 Users may rely on the Autodesign feature or select their own steel sections for analysis and code checks. When integrated within CADS products such as VelVenti windload calculation tool, the design process is completely automated and more streamlined saving time and reducing errors! To see the link in action click here. International Library of Steel Sections: UK, US, European, Japan, India etc. Connections at the eaves may be formed with or without haunches which, may be of the 2, 3 or 4 flanged type made from plates, or cut from sections. Select wall ties from the built-in library and specify their spacing for edge supports, pier/web to wall connections as well as cavity ties. Automatic checking of selection against the relevant shear reactions and load transfer across the cavity. SMART Portal provides comprehensive data bases of dead and imposed loads. The self-weight of the steel frames is accounted for automatically and casing loads for columns and rafters may also be picked from the loads library. All loads are displayed graphically as they are applied. SMART Portal saves huge amounts of your time by automatically generating all required load combinations and with the appropriate partial factors of safety, all of which can be reviewed and edited later, if required. SMART Portal provides automatic calculation of snow loading to BS 6399 Part 3 through a simple dialogue box that supports all typical conditions of longitudinal and transverse drifting. Snow loads are displayed graphically as they are applied. SMART Portal provides for the automatic calculation of wind loads on the structure and the autogeneration of load combinations with dead and imposed loads. SMART Portal automatically calculates the minimum horizontal loads and combinations required by BS 5950 Clause 2.4.2.3 to ensure adequate robustness. The notional loads of Clause 2.4.2.4 which allow for practical imperfections and lack of verticality are also included automatically. The main frame design is subjected to rigorous elastic-plastic analysis following the formation of plastic hinges up to collapse and allowing for ‘unloading hinges’. By default, second order P-Delta effects are included in the analysis for the estimated design, but these may be switched off in appropriate conditions. SMART Portal allows users to exercise their judgement to quickly change the program autodesign by means of just a few keystrokes. SMART Portal will optionally calculate the base moments and forces for the fire collapse condition in accordance with SCIP313. These are then incorporated as load combinations in the integrated base design module and the link to CADS Steelwork Moment Connection Designer for the baseplate connections. 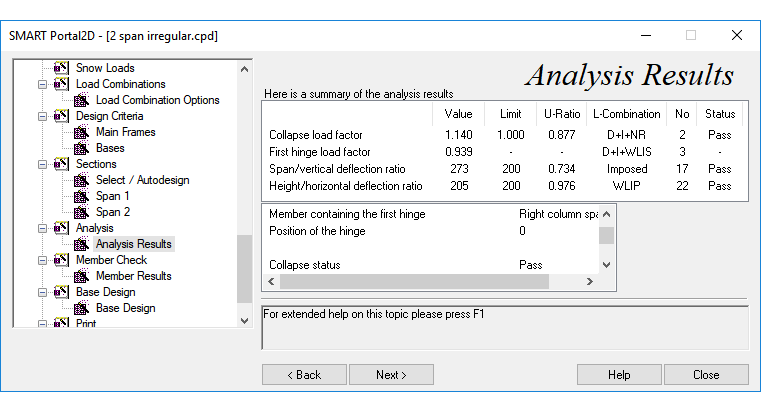 SMART Portal provides a unique ‘estimate’ or Autodesign function that, with a minimum of input, rapidly finds trial sections to satisfy your selected design criteria for the ultimate limit state, (collapse, first hinge or elastic) and serviceability (deflection limits). Users may also elect their own choice of sections for analysis / checking. SMART Portal carries out full member checks to BS 5950 for all load combinations, taking into account the presence or absence of plastic hinges, purlin and rail restraints. Stays may be added on a global basis to the whole frame or applied to individual members, as appropriate. 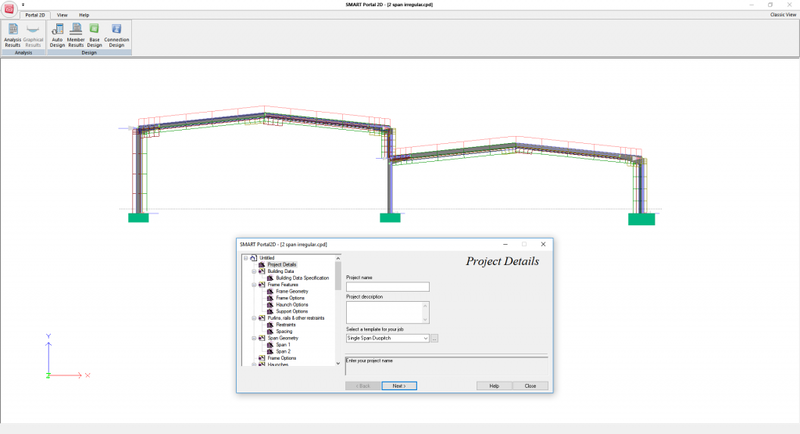 SMART Portal provides a seamless link to CADS Steelwork Moment Connection Designerfor design of moment connections for eaves, apex and base connections in accordance with the BCSA/SCI Green Book – ‘Joints in Steel Construction – Moment Connections’. 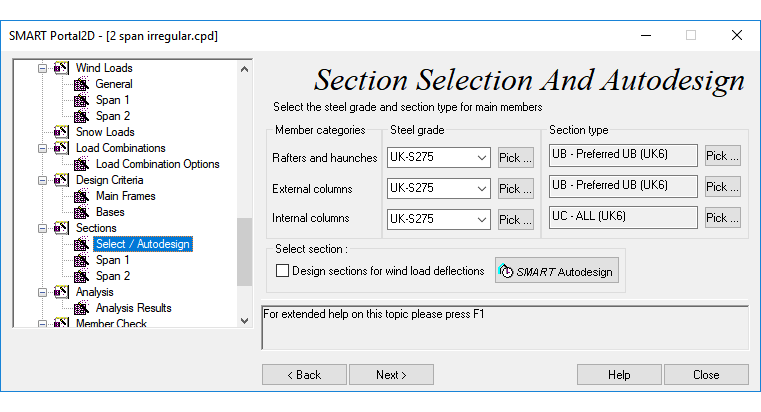 With CADS Steelwork Moment Connection Designer users can design a wide range of connections including verification of all components such as bolts, welds and a comprehensive range of stiffeners. Base plate connections cater for all degrees of fixity. Bases may be pinned, fixed or partially fixed by specifying a percentage of full fixity. Alternatively, partial fixity can be achieved by modelling rebar ties into suitably designed ground slabs. SMART Portal also provides an integrated solution for design and detailing of mass concrete or RC pad bases.